What is the cabinet inset made of? Looks like glass? cool, love it! thx for the quick reply! Can you tell me about the mosaic tile? Manufacturer and name of tile? Thank you for your interest in our bathroom remodel image! The tile shown here is from a line called Artistic Tile. For further information on availability of this product, in other colorways & ordering, please contact our office at 206-275-3399, we'd love to be of service for your tile needs! Where do you get the light pigment for the concrete? Roshini Hauser was the lead designer on the project and she worked with Absolute Concrete Works on this project. You may contact them directly for specifics on their process & materials. How do I get the inserts that are in the cabinet doors! I absolutely love them! This is a product called Lumicor. Another similar product is: 3Form. I have provided the links below. They are sold in sheets, and then you have them cut to the size you need! 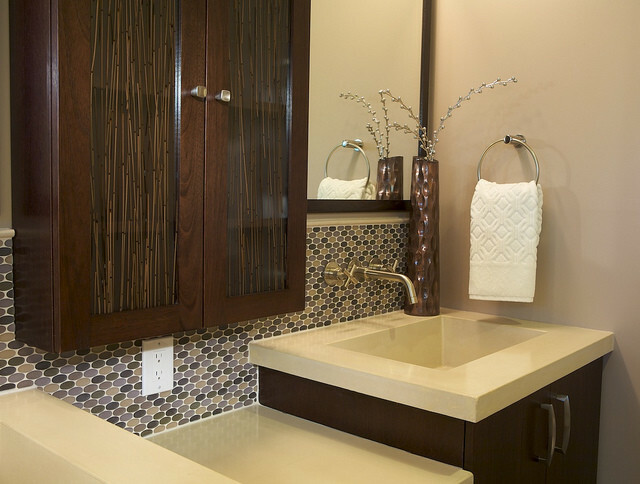 Concrete countertops perform well in the wet environment of the bathroom.